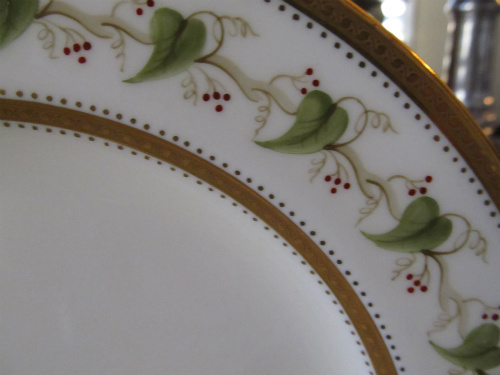 The beautiful place setting shown in our first photograph features an elegant Wedgwood gold-encrusted dinner plate with a pattern of green leaves and dark red berries around the rim. 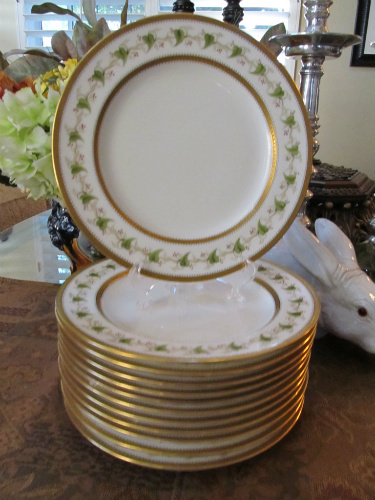 We are very pleased to offer this lovely Set of 12 Wedgwood Vintage Porcelain Ivy Motif Gold Encrusted 9" Dinner Plates. The outer rims of these gorgeous plates feature a rich, solid gold border of etched, alternating large and small dots framed by a ring of gold dots. 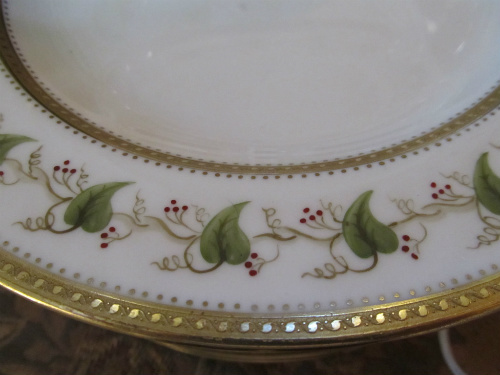 The leaf and berry pattern encircles the flat rim of the vintage porcelain plates, and the same rich gold pattern from the outer rim is repeated on the verge of the plates. These plates are quintessential Wedgwood: restrained opulence! 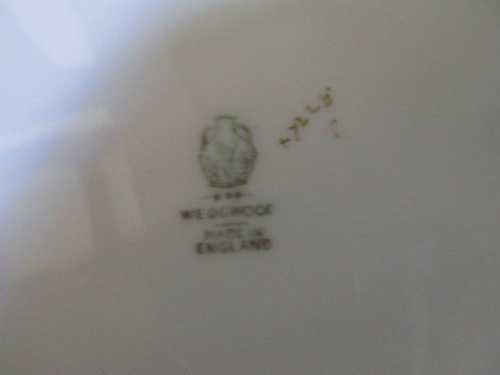 Identifying the pattern of these vintage Wedgwood plates has proved to be an elusive task. Based on the backstamp on these plates (see our photographs), we believe that they were made sometime between 1891 and 1925. 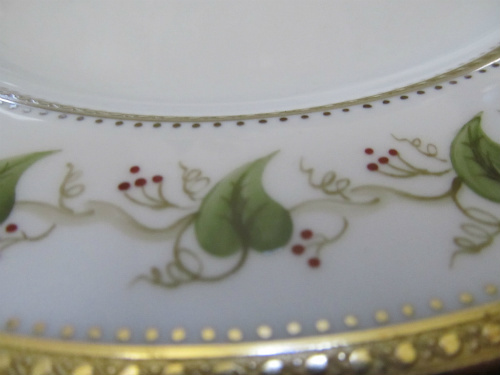 However, these vintage porcelain plates are in such good condition that they look as if they were made yesterday! 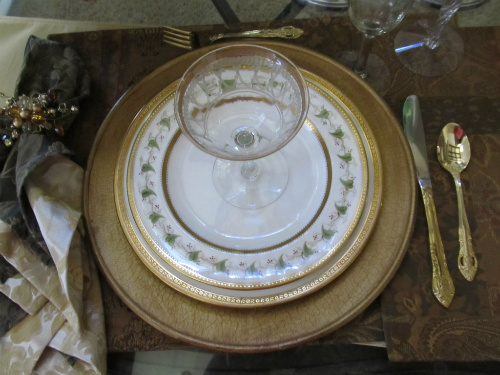 As our lovely place setting demonstrates in the final picture below, these lovely Wedgwood Ivy Motif Gold Encrusted Dinner Plates would pair beautifully with any set of fine china, be it Lenox, Minton or Limoges, so long as they are paired with pieces that have a pure white background and gilding. These vintage porcelain plates would also function independently as a luncheon or dessert set, and would be an important acquisition for any Wedgwood collector! Our shipping costs on this set of dishes will be $30.00. If this seems a tad high, please understand that in most instances, we will actually pay more to ship your items than we are actually charging! In addition, we will often send sets of dishes in multiple boxes because we pack them very carefully, to ensure that they reach you in the condition that they were in when they left our care. We often joke with each other that we could probably stick a stamp and a mailing address on our bubble-wrapped items, and dispense entirely with the box. That is because we use a large quantity of bubble wrap and other packing materials to protect the items that you buy. So please understand that the shipping we charge you reflects only a portion of our actual cost!